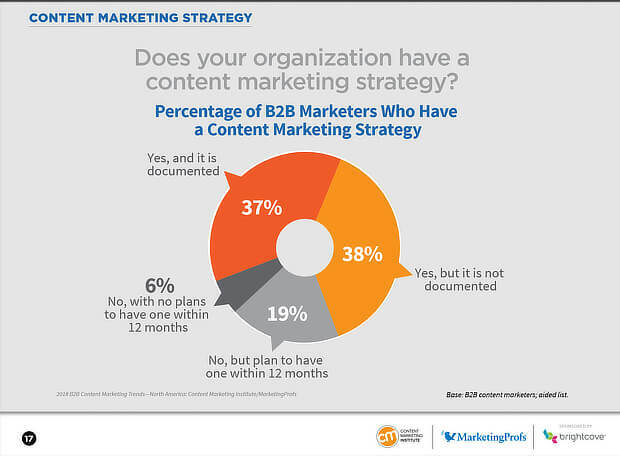 Did you know that 63% of businesses don’t have a documented content marketing strategy? That’s according to the latest research from the Content Marketing Institute (CMI) and MarketingProfs. It’s no surprise that those companies who DO have a strategy are most likely to feel that their content marketing efforts are successful. Without a strategy, success or failure is just a matter of luck – and you risk all your efforts going to waste. 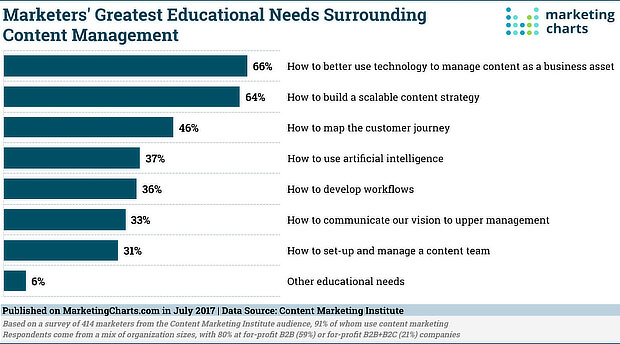 That’s likely why a similar percentage (64%) say that learning how to build a content strategy is one of their greatest educational needs. If you’re in that group, and have been wondering how to create a content strategy for your business, we’re here to help. We’ve successfully used content marketing to grow our own traffic and boost conversions since OptinMonster first launched in 2013, and we want to share with you what we’ve learned along the way. This guide will walk you through 11 simple steps to developing and executing a content marketing plan that’ll help you grow your business without wasting time and money. A good starting point for your content strategy plan is to set out a content marketing mission statement. This is a brief statement that makes it easier to focus on what’s important – and what’s not – in creating your content so your content marketing strategy stays on track. Here’s an example from CIO.com’s about page. It defines the audience (CIOs and business technology executives). It highlights the benefit (insights on career development). And it gives examples of what its content covers (certification, digital transformation, skills development and hiring practices). We provide [target audience] with [type of content] to help them [business goals]. While the mission statement covers what your audience will get from your content marketing strategy, you also need to think about what your business will get from it. That’s where your business goals come in. Making more sales and getting more high quality leads, which will help you meet your revenue goals. Getting more traffic to your site, as the more traffic there is, the greater the possibilities for meeting your other goals. Improving the perception of your business, so you gain influence and authority, and are seen as a thought leader. SEO success, which leads to more traffic. Reduced marketing costs, as your content becomes more effective. Social media engagement, which can help with both traffic and authority. Once you know your goals, it’s time to move to the next step. The best way to achieve goals is to make them specific and measurable. That means setting key performance indicators (KPIs) for your content marketing strategy. The KPIs will help you know when you have achieved your goals by providing milestones you can check off. They’ll include what you plan to achieve in terms of revenue, sales, traffic, SEO, traffic and different aspects of digital marketing like email marketing and social media metrics. Hit a certain revenue target within the month, quarter, or year. You’ll also want to pay attention to marketing expenditure, tracking your spend on different campaigns, and keeping an eye on the cost of acquiring leads and making sales. Learn more about KPIs for your content marketing strategy in our guide to content marketing ROI. As mentioned earlier, for a successful content marketing strategy, you’ll need to be clear about who your audience are so you can create the right content to reach them. There are three actions you need to take. The first step is to collect demographics on your visitors, email subscribers, and social media followers. You’ll also get insight into their key interests. To find this information in Google Analytics, go to Audience » Interests » Overview. You’ll see the market segments your web visitors fit into. Learn more about using Google Analytics in our in-depth guide. Here’s our guide to collecting feedback from your customers on your site. When you have demographic data and customer feedback, you can create or flesh out buyer personas. 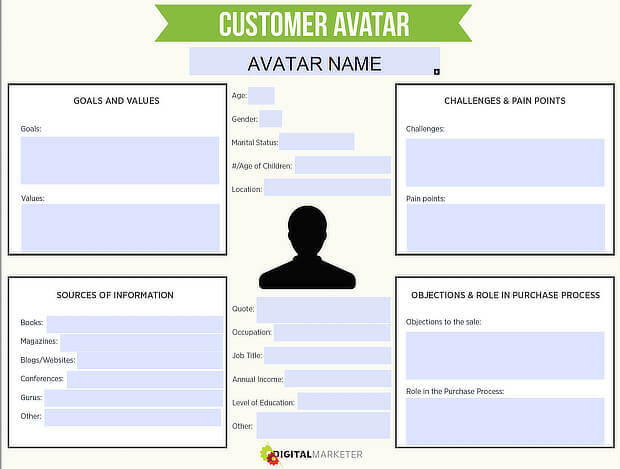 Buyer personas, also known as customer avatars, describe your ideal readers and customers so that you can target content better. The best customer avatars include information on your customers’ pain points, challenges, sources of information, and behavioral motivators. Many businesses already have content out there. This will include content that’s on your blog, as well as social media content, podcasts, videos, and so on. That’s why the next step is to figure out whether that content is helping you to meet your goals. You may also want to look at how your content compares with that of your competitors, and see how any new content will fit in the market. Let’s look at one example of how this would work for your content marketing strategy. The free version crawls up to 500 URLs. SEER Interactive has an excellent, in-depth guide to Screaming Frog. As a bonus, you can also use this tool for competitive research, carrying out the same kind of analysis on your competitors’ content. 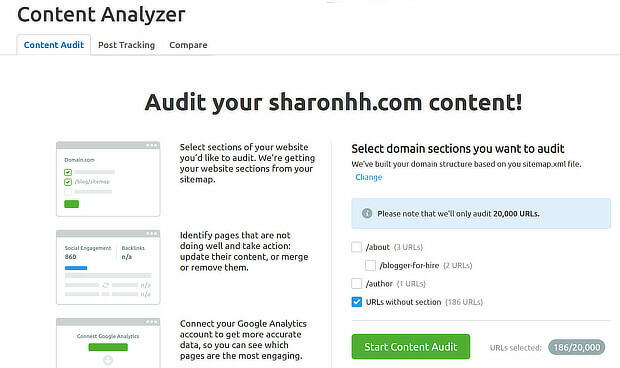 You can also log your content with the Content Audit tool from SEMRush. To do this, set up a project and select the section of your site you want to audit, such as your blog. Once you select the URLs, press the Start Content Audit button. Export the data to create a simple spreadsheet that contains all the URLs. You’ll get some of this information from the SEMRush report above, but can also find more by using other SEMRush tools, such as the site audit and position tracking tools. 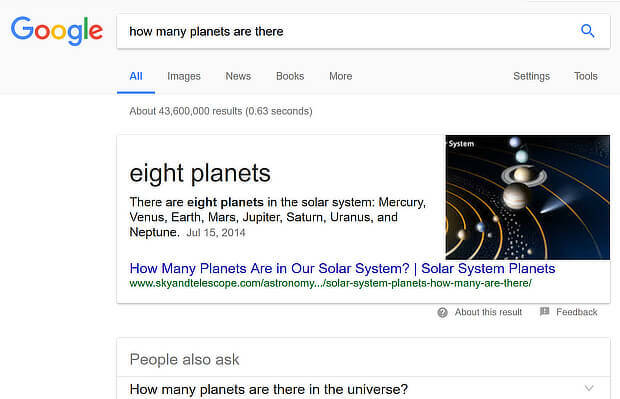 Content that’s starting to rank well but could be improved, say to target Google’s answer boxes. These are the boxes that appear above search results and provide the answers to a specific question. You can use Ahrefs to carry out a content gap analysis. To do this, go to Organic search » Content gap. Add the domains for your main competitors under Show keywords that the following rank for. Add your own domain under But the following target does not rank for. Press Show keywords. You’ll see a list of competitor keywords you can target with your own new content. You can carry out a similar analysis in SEMRush. Interested in more tools that can help in this area? Check out our list of the top 25 competitor research tools out there. As you work through this process, you’ll start to get a sense of where your audience is hanging out, and where you already have a successful online presence. It’s best to focus on what’s working and expand from there, rather than try to do everything at once. But to be absolutely sure, you’ll need to take another look web analytics. When you’re in Google Analytics, go to Acquisition » Social » Overview to see the main social networks where your content is being shared. For example, in our screenshot, most of the social activity takes place on YouTube. You can also refine your search terms for more detail. With this information, you can easily decide which networks to target to get social media engagement and shares for your content. Next, think about the types of content you need to create. 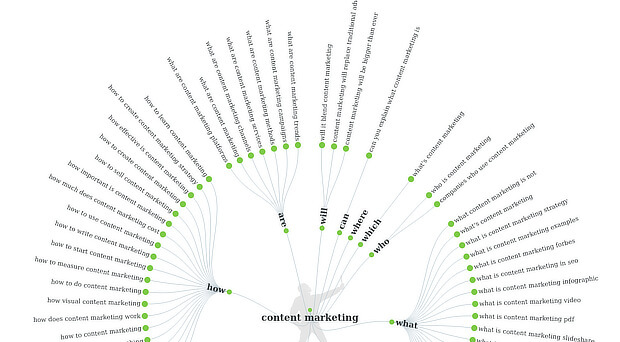 There are some content types that every content marketing strategy will include. Most successful content marketing strategies rely on having a central core of content published on your own site (or homebase) which can then be repurposed and shared on other sites (outposts). So blog posts are an essential part of your content marketing mix, and they still deliver strong results. Ideally, your blog posts will be actionable, valuable, and shareable, and may include a range of article types. You can use the Buzzsumo tool mentioned above to map the types of blog posts you want to create to the potential for social shares to boost engagement and reach. For example, OptinMonster readers really like how-to articles and lists. Click on a content type and a network to see a list of your most shared articles for that metric. Of course, creating a successful content marketing strategy isn’t just about navel-gazing to get stats on your own site. It’s also about seeing what other successful content is out there that you can use for inspiration. Buzzsumo can help with this, too. There’s also data on the most shared domains publishing on this topic, and the top pieces of content shared relating to it. Other Buzzsumo features allow you to track backlinks, trending content, and questions people ask, and the standard Buzzsumo search includes sharing data for videos. What other content should be included in your content strategy plan? As our own research shows, video marketing should be an essential part of any marketing, as it’s proven to engage your visitors to keep them on site longer, improve lead generation, and reduce abandonment. You’ll also want to include other types of visual content to improve engagement. 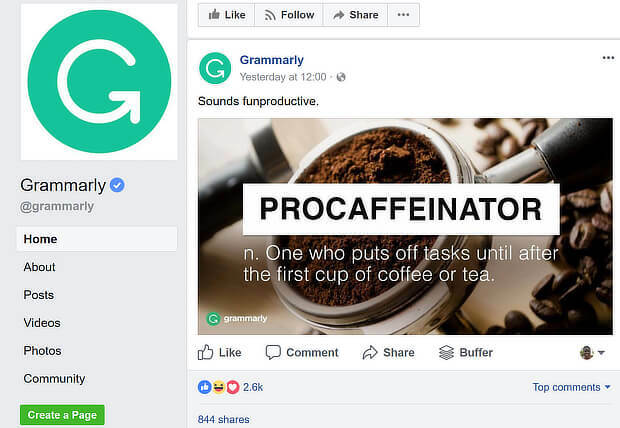 Consider creating infographics with tools like Piktochart and Canva, and using Canva and similar tools to create customized graphics and memes for social sharing, like Grammarly does. Other content types to include for improve lead generation include lead magnets like webinars, ebooks, checklists, worksheets, and more. It’s also worth thinking about podcasting as a content delivery mechanism, as more than 40% of Americans now listen to podcasts. Here’s a list of marketing podcasts for inspiration. The next step is to figure out what you need to create that content. Who’s in charge of producing and maintaining content? What human, physical or digital tools and resources do you need to create the content? What will your publishing workflow look like, including content scheduling? Who’s in Charge of Content Production? This question is about allocating roles. You’ll need to think about who’s in overall charge, as well as who is responsible for delivering individual content items. This will depend on the size of your company and content team, and on whether you’re doing everything in-house, or farming out content production. The CEO or chief marketing officer has overall final approval over content and content strategy. Your content marketing manager will be in charge of delivering on your content marketing strategy on a day to day basis, and will work with the content team. Individuals will create content, according to their expertise. What Tools and Resources Do You Need? 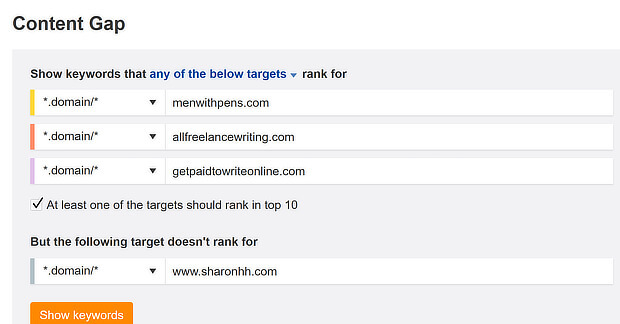 One way to find great freelancers quickly is to return to your Buzzsumo search results, and see who’s written the top content. There’s no harm in approaching them to see if they’re willing to contribute to your content team. You can also find great freelance content producers through networks like Contently, NDash, ClearVoice and similar. You’ll also need equipment for podcasting and creating professional videos, and you’ll need to arrange for hosting on sites like YouTube, Vimeo, Spreaker and Blubrry. Check out our list of video marketing tips to get started. There’s just one more thing to do before you get started on researching and creating pieces of content: creating a content calendar, so you know what’ll be published when. We’ll look at that in the next step. As part of your content strategy, you’ll need to know exactly when you want to publish your content on each of the platforms you want to use. Lack of planning is a key content marketing mistake, so it’s essential to use a content calendar to get all your content scheduled. There are several ways to do this. For example, you can use Google Calendar and simply put the due dates for each piece of content there. That works pretty well, especially if you’re not publishing a lot of content. That’s the simplest approach, but if you’re publishing a lot of content, and have to manage a content team and the production workflow you’ve decided on, then you’ll likely want some more features. Options for managing this include productivity and task management tools like Asana (shown below), or a purpose built editorial calendar tool like CoSchedule. Both of these will allow you to schedule different parts of the content creation process. One way to find content to add to the calendar is to do some initial research to find the topics your audience will respond to. We mentioned earlier the need to create content around what your audience wants. One way to find that out is to use Buzzsumo’s Question Analyzer or Answer the Public. Type a topic into the Answer the Public search box, and you’ll get a list of questions people have actually searched for on Google. Pick a question that seems relevant to your audience, decide on the type of content, such as a blog post, and add a title to your calendar. Repeat the process till you have planned out content for the next few months. As you’ve seen, there’s a lot of prep work in your content marketing strategy before you actually create a piece of content. But now it’s time to do just that. We’re going to use a blog post as our example, but these tips will work for almost any type of content creation. With the research you’ve already done, you’ll have an idea what type of blog post to create. For example, we know that list posts and how-tos are popular with our readers. Now it’s time to pick a title from the content calendar and start working on it. This’ll mean doing a Google search, checking out the top content for your topic, and seeing how you can improve on it. That’s called the skyscraper technique. Original research also does well, so consider this as an option if you’re collecting the right kind of data. Include keyword research to identify the key terms to use for better SEO and improved search ranking. We cover this process in detail in our keyword research 101 guide. Finally, start writing or creating your content. At this point, you’ll have to think about how to reflect your brand’s personality in the content you write. Set a schedule for sharing your content on social media, both immediately, and through a drip campaign via a tool like Missinglettr. Use email marketing to distribute your content to subscribers. Notify any influencers mentioned in your content to spread the word even wider. OptinMonster is also a great tool to use for promoting your content, both on your site and via your email newsletter. For example, Olyplant used OptinMonster to increase pageviews by 157%. OptinMonster customers have successfully used our marketing campaign software to triple their email lists and to get 3806% more conversions with gated content. Finally, it’s time to assess the success of your content marketing strategy. To do this, you’ll return to those KPIs you set at the start of the content strategy plan, and see what’s changed, and whether you’re hitting your targets. Other tools for tracking content marketing success include Google Alerts and Mention. Both of these will let you see if your content is being mentioned and shared, helping you hit those KPIs for awareness and engagement. Tools like SEMRush will help you to assess KPIs for the search rank of your content. And you’ll be able to track email signups through the analytics in your email marketing software. By monitoring your progress, you’ll be able to tweak your content marketing strategy at regular intervals, so it’s always up to date. That’s it! Now you know how to create a successful content marketing strategy from beginning to end. Next, check out these digital marketing hacks and SEO tips to help you make your content even more successful. You may also enjoy our post about how to harness the power of emotional intelligence in marketing! Ready to build your site? Check out our top picks for WordPress eCommerce plugins to build your best business. And don’t forget to follow us on Twitter and Facebook for even more in-depth guides and resources. Happy you enjoyed it, Jeremy. 🙂 One way to make sure your content is on point is to run an SEO audit using our in-depth guide.